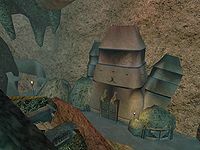 The Residential Ruins is a cave in the Battlefield of Old Mournhold connecting to Teran Hall and the Tears of Amun-Shae. You can reach the Residential Ruins through a heavily locked door from the City Gate. The northern door leads to the Tears of Amun-Shae with the two Goblin Warchiefs. 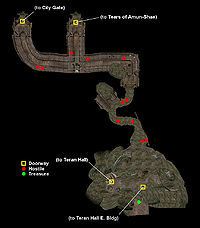 A path from the fork leads to Teran Hall with the two Altmer trainers. The level is guarded by a rat, a durzog, and nine goblins. On a raised area to the southeast is a bottle of sujamma and several crates and barrels. The only other treasure is a copy of 36 Lessons of Vivec, Sermon 19, an Enchant skill book, which can be found in another raised area, this time in the southwest. The Goblin Army: Investigate the rumors of a Goblin army being gathered by Lord Helseth. This page was last modified on 20 October 2013, at 16:33.